This very short story opens near the beginning of the Napoleonic wars (1803-1815). It tells of little Walter Erskine who at age six attempts to protect the young men of St Monance, Fife, from a possible press gang. Ten years later he is involved in a quite different way when a French sloop enters the unprotected harbour. 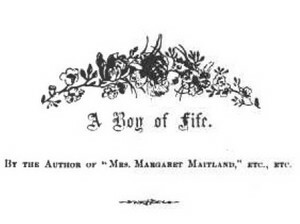 This story is probably based on one of the many stories of Fife told to Margaret Oliphant by her mother.